Silicone product suitable for flexible sealing and bonding, that can be subjected to high thermal stresses. 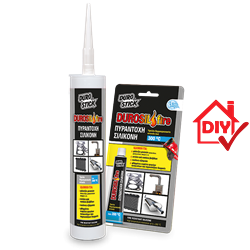 It offers high resistance to a vast range of chemicals, while creating unbreakable bonding on steel, iron and stainless steel. Resistant to oils, grease, gear oils, water, antifreeze fluids etc. DUROSIL FIRE is ideal for creating gaskets for engines(cars, motorcycles, boats etc. ), pumps, valve covers, exhaust pipes, and repairing leaking car radiators. It prevents smoking from woodstove duct joints. Indicatively, one 310ml cartridge fills 8 linear meters of a 6x6mm joint.